Check out Two Men From Emmaus! 1) Why would God send a Saviour who would be despised and rejected? 2) How can my heart be healed by Christ’s wounds? 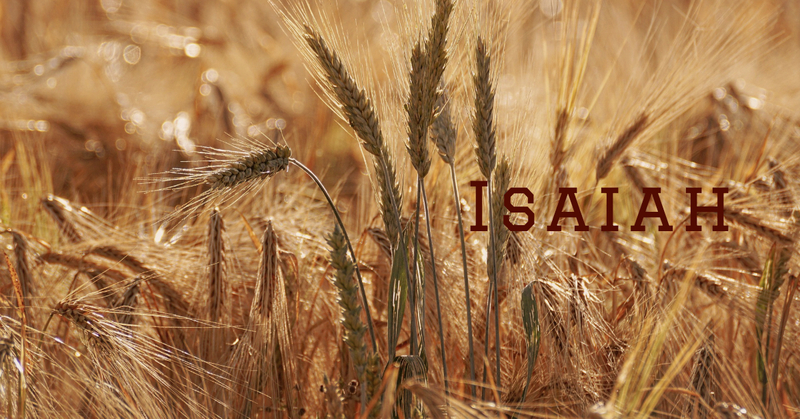 3)How should I respond after reading Isaiah 53? Who has believed what we have heard? And to whom has the arm of the Lord been revealed? 2 He grew up before him like a young plant and like a root out of dry ground. He didn’t have an impressive form or majesty that we should look at him, no appearance that we should desire him. 3 He was despised and rejected by men, a man of suffering who knew what sickness was. He was like someone people turned away from; he was despised, and we didn’t value him. 4 Yet he himself bore our sicknesses, and he carried our pains; but we in turn regarded him stricken, struck down by God, and afflicted. 5 But he was pierced because of our rebellion, crushed because of our iniquities; punishment for our peace was on him, and we are healed by his wounds. 6 We all went astray like sheep; we all have turned to our own way; and the Lord has punished him for the iniquity of us all. He was oppressed and afflicted, yet he did not open his mouth. Like a lamb led to the slaughter and like a sheep silent before her shearers, he did not open his mouth. 8 He was taken away because of oppression and judgment; and who considered his fate? For he was cut off from the land of the living; he was struck because of my people’s rebellion. 9 He was assigned a grave with the wicked, but he was with a rich man at his death, because he had done no violence and had not spoken deceitfully. 10 Yet the Lord was pleased to crush him severely. When you make him a guilt offering, he will see his seed, he will prolong his days, and by his hand, the Lord’s pleasure will be accomplished. 11 After his anguish, he will see light and be satisfied. By his knowledge, my righteous servant will justify many, and he will carry their iniquities. 12 Therefore I will give him the many as a portion, and he will receive the mighty as spoil, because he willingly submitted to death, and was counted among the rebels; yet he bore the sin of many and interceded for the rebels. 1)Why would God send a Saviour who would be despised and rejected? Isaiah 53:4 tells us Christ “bore our sickness and carried our pains” and verse 5 tells us we are healed by His wounds. On the cross, Jesus took the sickness of sin upon Himself, providing healing from wounds of the heart and soul we could never be cured of on our own. His physical wounds obtained our eternal, spiritual healing. The Gospel of Matthew refers back to Isaiah 53 in Matthew 8:16-17, describing the healing of the sick from physical wounds as well: “When evening came, they brought to him many who were demon-possessed. He drove out the spirits with a word and healed all who were sick, so that what was spoken through the prophet Isaiah might be fulfilled: He himself took our weaknesses and carried our diseases.” Christ died for us on the cross to forgive our sins, heal our hearts, carry us in our physical weakness, and bring wholeness for all who call on Him as Savior. 3) How should I respond after reading Isaiah 53? Isaiah 53 was written to point the original audience, a nation turned away from God, towards the eternal life and hope that would one day come for all through the Messiah. The prophesied picture of Jesus’ life and death in Isaiah 53, written in the 8th century, is an accurate portrait of what would happen to Jesus some 700 years later. Whether Isaiah had a vision of the crucifixion or just a revelation of what the Messiah would endure is unclear, but the commentary of Matthew Henry states, “No where in all the Old Testament is it so plainly and fully prophesied that Christ ought to suffer, and then to enter into His glory, as in this chapter.” Isaiah 53 was written to give all of us a clear picture of what the Saviour would be like and how He would suffer. It seems so natural to fight for my rights and to look out for number one. If I am wrongly accused or if someone tries to take advantage of me, I have no problem defending myself and seeking justice. That makes God’s silence in His suffering for my sins all the more incredible to me. I can’t even stand being falsely accused of line jumping at the amusement park, how could He carry ALL the iniquities of All who have sinned without defending Himself?! He who knew no sin became sin for us so that He could save us from the wages of sin: death. (Romans 6:23) He was rejected so I could be accepted. That truth is both astounding and liberating! Jesus’ love is amazing! Because of His great love, Jesus took my sin and gave me eternal life. He makes a way for me to live healed and free from the heart sickness of sin. He gives me His Word to change me (Hebrews 4:12) and His church to strengthen and encourage me (Ephesians 4:15-16). In Psalm 34: 17-19, the promise is that the Lord delivers the righteous from many afflictions, even broken hearts and crushed spirits. He also promises in Romans 8:28 that He works all things together for our good. Even when I face things I don’t understand or go through things that cause me pain, I know God is in control and is working it out for my benefit. I keep seeking to understand His ways while praising Him daily that His death on the cross gives me abundant life now and eternal life hereafter. The only reason God was “pleased to crush” His Son was because He loved us so much and hated sin so greatly. Just as Isaiah’s first audience had turned away from the Lord God to love idols instead, so have each of us. We have all chosen to love our sin over the Savior. God knew the only way to reconcile us back to Himself was through the sacrifice of Jesus. God wants us to accept that free gift of salvation won for us by Jesus’ death on the cross. Christ died so we might live, and that is what God wants for us! He wants us to live in the freedom and grace of His love and forgiveness. If you have never accepted His gift of salvation, all you must do is believe Jesus is God the Son, fully able to pay the penalty for your sin, and trust in His finished work on your behalf. (Romans 10:9) If you’ve already trusted in Jesus, reach out to those around you who need to hear the Good News and share it with them today! 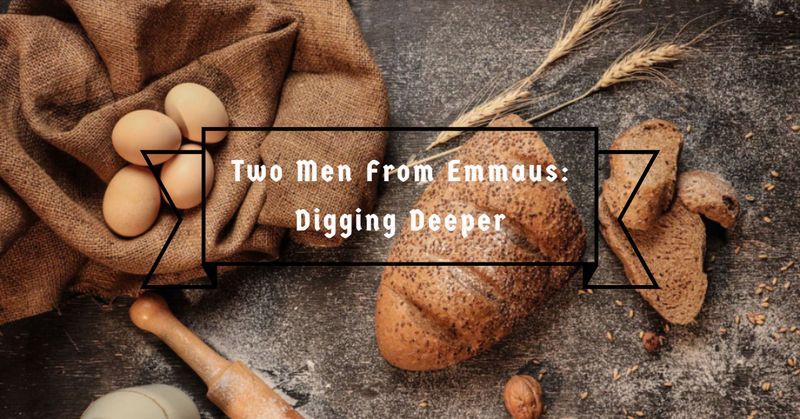 Catch up with Two Men From Emmaus! This is Cross Week Three! 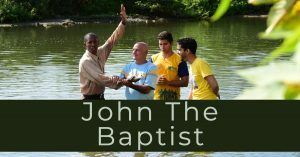 Check out John The Baptist! 2) Why does it matter what he was wearing and eating? 3) Who are the Pharisees and Sadducees and why is John mad at them? 4) What imagery is John describing at the end of the passage? Now John wore a garment of camel’s hair and a leather belt around his waist, and his food was locusts and wild honey. 5 Then Jerusalem and all Judea and all the region about the Jordan were going out to him, 6 and they were baptized by him in the river Jordan, confessing their sins. 2) Why does it matter what he was wearing? The belief held among theologians is Matthew describes John this way for one very specific purpose. The reason is thought to be, he was emulating the appearance of Elijah the prophet (2 Kings 1:8) because he was the first prophet on the scene since Malachi 400 years earlier. People would have seen John and immediately recognized him as a prophet simply by his appearance. They would have remembered the oral traditions of the stories of God’s prophets heralding repentance. The Pharisees and the Sadducees were the religious leaders of the 1st century. They were lording the rules and regulations of the Old Testament over the people of Israel as a hard and fast rule of law. They had added “extra rules” to the original law of Moses, enforcing heavy burdens on the Jews. Jesus described them as “white washed tombs” (Matthew 23:27-28) because they followed the rules on the outside, but there was no heart transformation. John knew their hearts and why they had come to see him. It had nothing to do with a desire to repent and be saved, rather they wanted to rely on their ancestral heritage of being a child of Abraham through bloodlines. They saw this as a “free pass” to continue in their prideful sins of the heart as long as they had lineage and “rule-following” appearance in their favor. John’s message was one of repentance. He proclaimed when Jesus came, He would judge the earth. The imagery used by John shows the judgement Christ will render. There will be a time when the followers of Christ will reign with Him and those who choose not to follow will be like chaff burned up in the fire of judgement. The importance of John the Baptist to the Gospel is imperative to understand. He was prophesied about in the Old Testament (Isaiah 40:3, Malachi 3:1) as the one who would come before Christ to tell the world of the coming Messiah. The message of repentance would be on his lips. We can look at John and see a standard of true gospel living. He pointed to Christ and walked humbly waiting for Him to come. From the womb where he leaped with excitement (Luke 1:41), to the tomb where he lost his head because he faithfully followed Christ. 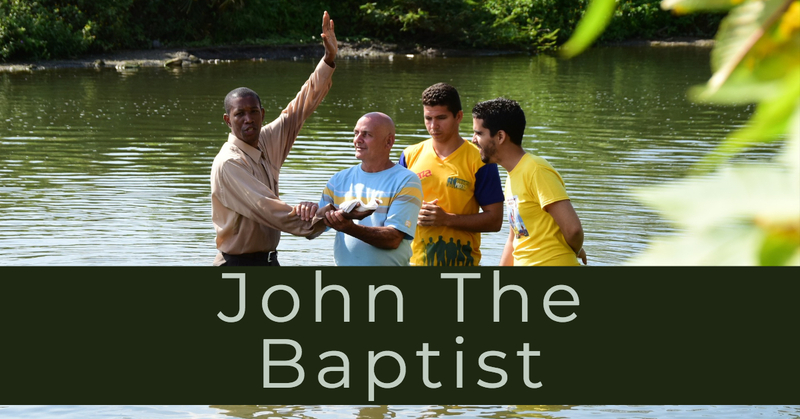 John the Baptist is a follower whose entire life points to the redemption found at the cross. In a day and age of wealth and prosperity, it is important for believers to be mindful of the lifestyle they live and where their priorities are centered. John the Baptist went out of his way to run counter-cultural. He used the clothes he wore and the food he ate as a visual representation of his commitment to the Lord. This does not mean you have to eat honey and locust and wear camel hair, but we should be challenged to evaluate where we spend our money and how we spend our time. We should ask ourselves, do we point to the cross of Christ? When people saw John the Baptist, he stood out as a prophet and he not only represented himself in physical appearance as a prophet, but his message of repentance matched his actions. The words he spoke pointed directly to Christ as the coming Messiah. Could we say the same? Do we stand out in our representation of Christ or do we “fit in” with the culture? Do we proclaim a coming Messiah with every part of our being? 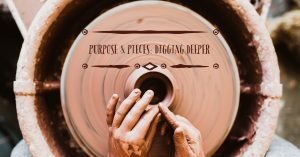 Are we leveraging our material possessions, how we carry ourselves, and the words we speak to point people to the hope of Christ? I, for one, find it difficult at times to watch believers misrepresent the Gospel. This was the issue John the Baptist had with the Pharisees and Sadducees. We will all mess up because we are sinful people living in a sinful world, but this perpetual choosing goes beyond that. The religious leaders of the 1st century prided themselves on their “perfect” behavior when in reality they were missing the cross, Christ, and the Gospel altogether. The habitual prideful heart of other believers should upset us. If we see it in ourselves, we should repent, and we should ask other believers to confront us when they see it. If we see it in our brothers and sisters in Christ, we should keep each other accountable to representing the Cross well with God-honoring actions, beliefs, and attitudes. There are times in Scripture where the consequence of sin is given in perfect imagery. The brokenness of humanity and the separation from God a world full of people experience, is spelled out so clearly in this passage. This should be a wake-up call as believers that we could once be described as such, chaff burning in the fire. This should prompt us to speak His name, His truth, and tell of His amazing grace to a world dying without Christ. Everyone has a place in His presence, and we are His representatives, His ambassadors just as John was. Our job is the same as his, to point to the Cross with the entirety of our lives! 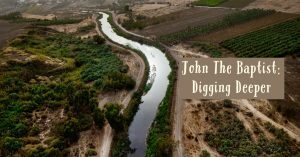 Catch up with John The Baptist! For a moment, I doubted. I was stuck in a prison cell, jailed for calling out Herod Antipas for his sins. I did no wrong; in fact, I was doing the will of God. But was Jesus truly God? Was He the one we had been waiting for? Was He really who He said He was? my being set apart from birth, the preparation, the preaching. Enough to justify prison and facing death? and he will be filled with the Holy Spirit even before he is born. He will bring back many of the people of Israel to the Lord their God. As a boy I didn’t know what it all meant, but I listened for the voice of God to lead me; I was so eager to fulfill His calling on my life. To make others ready for the Messiah!! What an honor! My mother said Jesus was her cousin’s child, my distant relative. She remembers so vividly when I recognized Him, even while we were still unborn in our mothers’ wombs. This child, born after me, would be greater than me or anyone else who ever walked the earth because He was born of God’s Spirit, not from man. My appointment was to call people to repent of their sins and ready themselves to receive Jesus as their Savior from sin! I could baptize with water, but Jesus the Christ would baptize with the Holy Spirit! Instead of following in my father’s footsteps and studying under a rabbi to become a priest, I followed God out to the wilderness. I had no profession other than practicing the discipline of listening to the heart of God and worshipping Him. I had no true home and only the land to live on. I spent years wearing clothes made from camel hair and surviving on just locusts and wild honey. But God was with me, teaching me, preparing me to be an outspoken evangelist. I wasn’t caught up in caring what people thought, what they said, or even how I suffered. because I spent decades focusing on God alone. This was the fullness of my purpose, and with great zeal I leaned into the work! People came out of the city to listen to me and be baptized. Despite my father’s words that I was a special gift, I knew the true gift was what the Lord was doing in me. He prepared my own heart to receive His Salvation. I preached the unpopular sermon of repentance many prophets before me had declared. Yet remarkably, I could see God point others beyond myself to One Coming. I still remember the day Jesus came to the Jordan River to see me. His purpose was so intentional. How my hands shook as He entered the Jordan and our eyes met! Here was the moment, Jesus was The One, yet I couldn’t help but back up. He should be baptizing me! I was not worthy to untie His sandals, let alone baptize Him! “Allow it for now, because this is the way for us to fulfill all righteousness”, Jesus insisted. He went under the water like all the others I had baptized, but when He rose up, the skies opened and a white dove descended to rest on Him. God had told me to look for that sign, for it would signify the Messiah. What an honor! My heart came alive – truly alive! Here was confirmation of God fulfilling His promise both to Israel and myself! I stood motionless, taking in this magnificent occasion. Arms stretched to heaven, I glorified God the Father as Jesus the Messiah, God in the flesh, stood with me in the river. His ministry began and I continued to confront sin in peoples’ lives, clearing the path before the Savior of the World. When it was King Herod whose sin I called out, I was locked up. Faced with looming execution, the doubts and questions came rapid-fire. Will Jesus save me from this? Was I duped, or is He truly the Messiah? Were my efforts for naught? My life had been surrendered to ministry in Jesus’ Name since before I was born. I’d experienced incredible moments – proofs – of Jesus having the very nature of God wrapped in humanity’s skin. None but God could do these things. Still, there I sat, awaiting death for doing the will of God. Isaiah foretold how Jesus’ message would be offensive and bring persecution for those who loved Him. But as Jesus now reassured, this message was the one by which all peoples who embraced Him would be blessed. The cost of sacrifice was for all followers. Was it worth it to be counted among those who were granted eternal life because they were not offended by His grace? And here I rest in confident peace. Check out Purposes & Pieces! 1) Who is the High Priest referenced and how did he “pass through the heavens”? 2) What “confession” are we to “hold fast to”? 3) Why is it significant that the High Priest has been tempted “in every way we are”? 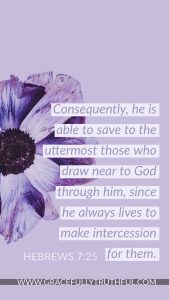 Therefore, since we have a great high priest who has passed through the heavens—Jesus the Son of God—let us hold fast to our confession. 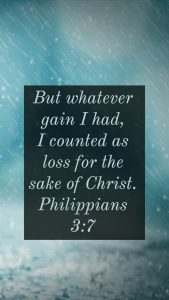 15 For we do not have a high priest who is unable to sympathize with our weaknesses, but one who has been tempted in every way as we are, yet without sin. 16 Therefore, let us approach the throne of grace with boldness, so that we may receive mercy and find grace to help us in time of need. Verse 14 continues by answering exactly who this High Priest is: Jesus Christ. The name “Jesus” meaning our Savior, and the title of “Son of God” signifying complete authority as God and Himself having the full nature of the Divinity. This is the Son of God who had been promised to come to earth centuries earlier through the prophets, and even hinted at as far back as the Garden of Eden. There is no question in the original hearer’s minds, Jesus Is God. The only God, the Great I Am, co-equal with God the Father and pre-existing with God the Father before Time itself began. The bold statement leaves zero room for any other conclusion or theory. Jesus wasn’t a “good man”, a “popular prophet”, or a “figment of imagination”. No, Jesus is the Son of God. 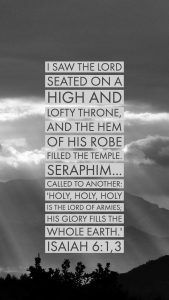 The Messiah, the Savior of the world, who “passed through the heavens” by setting aside His rightful Glory, in order to come to us for one purpose: to reconcile us to Himself by becoming our High Priest. The “therefore” at the beginning of verse 14 links the full words in the first question to this phrase, “let us hold fast to our confession.” Because Jesus, the Son of God, has passed through the heavens and become our High Priest, we can confidently hold fast to our confession. The “confession” is clarified by a cross reference to Hebrews 10:23 which states, “Let us hold fast the confession of our hope without wavering, for He who promised is faithful.” The confession is the same one Paul speaks of when he instructs non-believers to “if you confess with your mouth that Jesus is Lord and believe in your heart that God raised him from the dead, you will be saved. 10 For with the heart one believes and is justified, and with the mouth one confesses and is saved.” (Romans 10:9-10) The author of Hebrews is encouraging his listeners to not turn away from the gospel they both confessed with their lips and believed in their hearts. Jesus alone can save us and keep our souls for all eternity; we are to guard that and keep it at our forefront. Later in Hebrews 5:2, the author writes, “He can deal gently with the ignorant and wayward, since he himself is beset with weakness.” In my arrogance as a parent, sometimes (er, often…), I get greatly annoyed with the little owies and complaints and fringe injustices that my children want me to listen to. They want real compassion, they want someone on their side, they will even ask me things like, “Have you ever had a splinter go into you hand?” What they want to know is am I really “there with them”, or am I just so far superior that I could care less about their childhood aches and pains. What would be arrogance on my part, is something the Lord will never do to one of us as His children. Abuse? He’s experienced it. Disrespect? Yes. Injustice? Ridicule? Harsh words? Rejection? Abandonment? Loneliness? 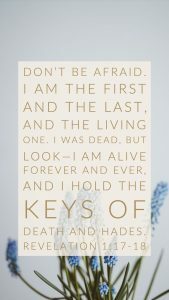 Fear? Stress? This High Priest who passed through the heavens came that He might be our High Priest, a very “with us” God, One who has experienced the highs and lows and everything in between that we have, yet was without sin, that He might fulfill His purpose, sacrificing His blameless self that we might have direct, unabated access to His Glorious Throneroom! I love finding the “gospel in a nutshell” in just a few short words scattered all throughout Scripture, and this verse doesn’t disappoint! Sometimes, we need to intentionally slow way down when we think about Jesus and God, and ask obvious questions, then allowing ourselves to wrestle with the answer. Not a “church-y” answer, but one that’s well though through, one we know exactly what every word in our response means. For example, consider if someone asked you the following questions. Take some time to slowly and thoughtfully write down your answers that involve more than a few words. Put some meat on the bone of what you believe! Consider if someone were to ask you: Who is Jesus? Why did He die? How can one man take away “all the sin” of the world? Why do Christians say that Jesus is God? Enjoy your time of discovery then share it with a friend, challenging them to do the same! It’s one thing to mentally understand what the author is saying in these verses and be able to follow his reasoning, but it’s quite another to put it into everyday, practical practice. When the cereal explodes from the minivan….we need the gospel at the forefront to remember that we are sinners just like our children, and we make plenty of bigger messes in our relationships and other areas, yet the High Priest intercedes on our behalf! When a spouse blows up over something you know you didn’t do and your first reaction is to jump to anger….we need to keep the gospel at the forefront. 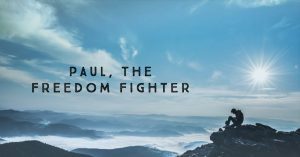 The gospel that says man’s anger never accomplishes the righteousness of God and that, if Jesus can stand in our place, though we woefully are undeserving, we can offer the same grace in a loving way. How often do we easily fall into thinking, “I’m the only one like this. Only I struggle in this area. I’m alone.”? These are lies straight from the Enemy of our Souls and we must fight against them with Solid Truth. Truth that says we are never alone, we have been bought with a price, Jesus is “for us”, there is no condemnation or shame for those in Christ Jesus. These are truths to win a battle with! Take time to slowly think through the soundtrack that plays in your mind as you go through your day today. Where are you critical, performance based, without grace, and freely distributing negative words to yourself and others? Challenge yourself to fight back with truth. Arm yourself well with Scripture, and hold tightly to the glorious gospel, knowing you were bought with the precious blood of the High Priest who knows exactly what it’s like to be you! Catch up with Purpose & Pieces!